Tutti Audio announces most luxurious (and most expensive) stereogram ever | What Hi-Fi? It will support Bluetooth, wi-fi, turntables and network players, and comes with a pair of integrated Icon Audio loudspeakers. The re-emergence of the turntable has led to some unique new products. There are vinyl subscription services, records filled with blood and, from Tutti Audio, a new stereogram. Taking over 200 hours to make each one, the company says its latest product gives a "mid-century twist of retro" to the modern conveniences. And looking at the spec-sheet, it's hard to disagree. The stereogram has Bluetooth and wi-fi connectivity, sockets for analogue and digital sources - as well as outputs for headphones - and support for USB. Turning the clock back a few years - in terms of technology, not quality - there's space to house a (deep breath) valve amp, solid state amp, turntable, CD player, streamer, tuner, tape player and iPod dock. Each of these can be connected out to other speakers through the rear-facing input/output panels, but there's also a pair of 20cm 90W loudspeakers from Icon Audio integrated into the cabinet. As an added touch, there's also mood lighting available under each plinth, and the stereogram comes in a variety of colours: red, light blue, dark blue, green, or white. Unsurprisingly, this kind of craftsmanship doesn't come cheap. 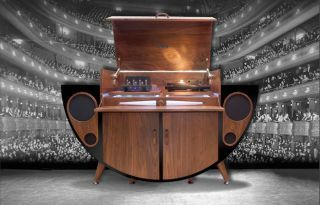 The price of the stereogram with an Icon Audio valve amp, Pro-ject Debut Carbon turntable and Onkyo C-N7050 streamer/CD player is around £20,000. Prices start at £18,000, without any hardware beyond the speakers. It'll be quite a wait too - each stereogram takes around 16 to 20 weeks to build - but Tutti Audio is adamant it's worth the wait.